Hans Memling belongs amongst the most important painters of the Flemish primitives. There is an exceptionally large number of his panels that have been preserved. This includes some one hundred altar pieces, devotional triptychs and diptychs and around 30 subtle, idealised portraits. The surviving oeuvre shows the success of the artist, who commanded a productive and well-organised workshop. 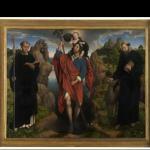 A noticeably large percentage of Memling's commissioners consisted of foreigners. Primarily Italian and Spanish merchants and bankers made up his client base, though Bruges patricians also turned to Memling for their portraits and altarpieces. Although he apparently never worked for the Bruges city administration, he completed no less than four commissioned works for the Saint Jan's Hospital. The style and composition of his paintings display a unique synthesis of influences from both Van Eyck as well as Van der Weyden. He also introduced his own important innovations such as the landscape background in his portraits. As a painter, Memling had a respectable following both within and outside of Bruges. He even exerted an influence upon Italian painting. Hans Memling was born around 1435 in Seligenstadt (present-day Germany). His parents were Hamman Mommeling and Luca Styrn. They probably died in 1450 of the Plague. His upbringing and education is not documented. He was most likely a student in Cologne, because his oeuvre suggests a large depth of knowledge, especially in the art of the Cologne painter Stefan Lochner. After his schooling, Memling departed for the Low Countries where he most likely worked in Rogier van der Weyden's studio in Brussels. Immediately following, he established himself in Bruges. 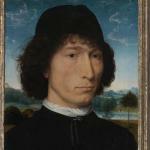 Memling obtains the Bruges portership in order to set up a studio as a painter and to be able to work. The mention of the painter in the Brugse Poortersboeken is the first archival data for the artist in Flanders. In addition to his father's given name, the registration mentions the birth place of "Jan van Mimnelinghe" as "Zaleghen Stat" (Seligenstadt). Hans Memling rents a complex of two stone houses on the Vlamingdam and the Jan Miraelstraat. It is not an exclusive area, and for the most part guildsmen and artists live there. 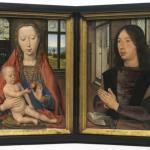 Memling paints the Jan Crabbe Triptych. It was distributed amongst various institutions and the panels were cut lengthways down the middle (Museo Civico, Vicenza (middle panel); Pierpont Morgan Library, New York (interior panels); Groeninge Museum, Bruges (exterior panels)) on assignment from the abbot of the Bruges Duinen Abbey. On the exterior panels the Annunciation is portrayed in the form of a semi-grisaille. The Medici banker Angelo Tani gives Memling the assignment for the Altarpiece of the Last Judgment (Museum Narodowe, Gdánsk). The altarpiece, originally intended for the Badia Fiesolana near Florence, was transported in 1473 and captured by Hanse pirates. Presumed date of origin of the Portrait of Tommaso Portinari and the Portrait of Maria Maddalena Baroncelli, possibly on the occasion of their wedding (Metropolitan Museum of Art, New York). The portraits originally make up a portion of a devotional triptych for the Florentine banker, who also worked as an advisor to the duke of Burgundy. Memling paints the Passion of Christ (Galleria Sabauda, Turin) on assignment from Tommaso Portinari. Memling also completes Virgin and Child with Donor and Saint Anthony (National Gallery of Canada, Ottawa), dated ‘1472' on the painting. The work bears witness to the increasing influence of the Bruges painting tradition of Van Eyck and Petrus Christus on Memling and is probably inspired by Van Eyck's Maelbeke Madonna (a copy is present in the Groeninge Museum in Bruges). Memling also paints the portrait of the Flemish singer and composer Gilles Joye (Sterling and Francine Clark Art Institute, Williamstown). 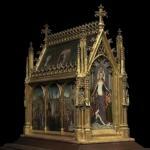 The work is dated 1472 on the original frame. Memling completes Man with a Roman coin (Royal Museum of Fine Arts, Antwerp), which presumably is the portrait of the Venetian Pietro Bembo. It is the unsurpassed Brit James Weale (1832-1917) that discovers that this panel, which previously was attributed to Antonello da Messina, was actually painted by Memling. "Meester Hans, Painter" enters the important Brotherhood of the Our Blessed Lady of Snow, which is since 1472 housed in the Our Blessed Lady Church. On assignment by the Bruges Saint Jan's Hospital, Memling works on the Saint John Altarpiece, which is mounted on the main altar of the Hospital's church in 1479. 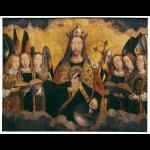 The monumental triptych is dated and signed. ("Opus Iohannis Memling 1479"). The composition of the central panel is clearly influenced by Jan van Eyck. Memling paints on assignment from the illuminator Willem Vrelant the now-lost, side panels of a tableau for the librarians' chapel in the Eekhout Abbey in Bruges. This work is the only assignment that is documented in contemporary sources. In addition, Memling realises the Altarpiece of Sir John Donne (National Gallery, London). Sir John Donne was an English courtier who stayed in Bruges for a period of time. Memling makes the Triptych of the Adoration of the Magi (Jan Floreins Altarpiece) on assignment from a brother of the St. Jan's Hospital. 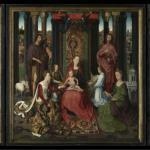 The triptych is probably destined for a side altar and is signed and dated ("ANNO MCCCCLXXIX-OPUS JOHANIS MEMLING"). 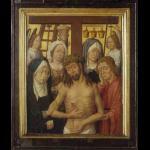 The middle panel is inspired by Van der Weyden's Columba Altarpiece (Alte Pinakothek, Munich). Hans Memling buys the larger of the two houses that he occupies. This indicates that he is certainly well established. The work of The Seven Joys of the Virgin (Alte Pinakothek, Munich) is placed on the altar of the tanners' chapel in the Bruges Church of Our Lady in 1480. The panoramic, history painting was painted on commission by Pieter Bultnyck. "Meester Jan van Memmelynghe" takes on Hannekin Verhanneman as "leercnape" (apprentice) on 8 May. The city of Bruges receives an obligatory loan levied to finance the field offensive of Archduke Maximilian against the French. Memling, like the other citizens, must also pay his part of the loan. He belonged amongst the richest ten percent of the denizens of Bruges. Memling paints the Lamentation (Triptych of Adriaan Reins), dated 1480 as a project from a brother of the Saint Jan's Hospital and in addition he completes the only preserved portrait of a female: Portrait of a Woman (or Sibylla Sambetha, dated 1480) (Memling in Saint Jan's Hospital Museum, Bruges). Memling receives the assignment from the Bruges herbalist and politician, Willem Moreel for his altarpiece for the family chapel in Saint Jacob: Saint Christopher Altarpiece (Moreel Triptych) (Groeninge Museum, Bruges). Sixteen of the eighteen children of the Moreel couple are depicted on the side panels. Some were even added after the completion of it. Memling realised with this one of the earliest presentations of a group portrait. 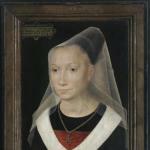 Memling's wife Tanne dies and leaves three underage children behind: Hannekin, Neelkin and Claykin. It is also the date of origin for the Diptych of Maarten van Nieuwenhove (Memling in Saint Jan's Hospital Museum, Bruges), which belongs amongst the most ingenius and original works of the Flemish primitives. In that same year, he creates the closely-related Benedetto Portinari Triptych (dated 1487) (Staatliche Museen, Berlin (middle panel); Galleria degli Uffizi, Florence (side panels)). 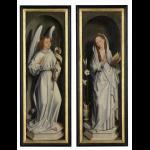 Memling completes the Saint Ursula Shrine on order by the cloister community of the Saint Jan's Hospital in Bruges. Within the cloister community, it was said that the artist had traveled to Cologne for this at the cost of Adriaan Reins. Commission for a multi-panel work for the cloister church of Santa María in Real in Nájera (Spain). Only three panels with Christ with singing and music-making Angels are preserved. (Royal Museum of Fine Arts, Antwerp). They originally form the upper register of the multi-panel. They clearly show the influence of the Ghent Altarpiece (1432) of the Van Eycks in Ghent (Saint Bavo Cathedral). Recent scholarship suggests that the three panels, which with respect to technique are rather different, were painted separately in Spain by members of Memling's studio. The monumental Crucifixion Altarpiece (Greverade Triptych) (Sankt Annen-Museum, Lübeck), dated 1491, is probably Memling's last major project that is preserved. The dating is probably not from the completion of the work, but rather the commission. The triptych, which contains two sets of panels, was ordered by the influential Greverade family from Lübeck and was destined for the Dom Church in the Hanse city. Hans Memling dies on 11 August. Rombout de Doppere mentions his death in his chronicle of Bruges and cites Mainz as his place of birth. He means the Archbishopdom, not the city. Memling was registered in the obituarium of the painters' guild. He was buried in the churchyard of the Saint Gillis Church, in the parish where he lived.